Send me any question you’d like about the music business. You can send questions about recipes for casseroles, solar energy, or Harry Potter as well, but I don’t know much about those things, so for your sake (and mine), keep the questions limited to anything about the music business. Your inquiries along with my responses will then be posted here on the My Cousin Rick blog. Your name will be changed to protect your identity so ask any question you’d like! 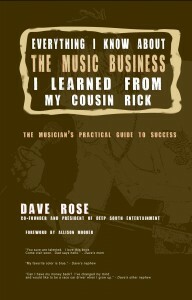 Please send your questions to daverose@daverose.info or tweet @DaveRose9811.